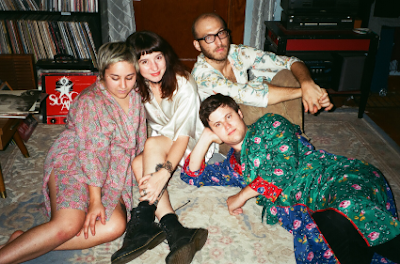 An interview with Nashville's Idle Bloom to celebrate their new album. Nashville punk rock outfit Idle Bloom is finally back with a new album, Little Deaths, a follow up to their incredible Some Paranoia EP from 2015. With honest songwriting, searing guitars, turned-up bass, and crashing cymbals, the foursome’s music is a shining light in these frighteningly dark times. The lead single from the new record, “Hive,” features their signature pop-psychedelic-infused sound with Olivia Scibelli’s earnest vocals riding over top. The band was crowned local alt-weekly Nashville Scene’s best band of 2016, a huge honor for the two-year-old band in an intensely competitive music town. The feminist, politically-inclined band has always been busy, playing tons of shows locally and touring whenever they could. With their album now officially out, things aren’t slowing down. Scibelli answered some questions for me via email and we discussed the DIY scene, Nashville charities she loves, and the band's songwriting process (which partially took place in a church from the 1800s). Little Deaths is out today on Fraternity as Vanity and you can pre-order the physical album here. THE LE SIGH: I know you're involved in Nashville with the Southern Girls Rock and Roll Camp. Can you explain your involvement? Is that how you got started in music? Olivia Scibelli: Actually, yes! That’s what inspired me to start a band! I’ve played guitar seriously since I was about 13, but it was an acoustic guitar, and you know that’s a different vibe. I’d always wanted to be in a loud guitar-driven band; my heroes were PJ Harvey and Patti Smith. Flash forward to my first year as a volunteer at camp and I was so inspired. It’s a tradition of ours to do a volunteer band and we play a song at the end of every showcase and that year I played bass and sang along to “Rebel Girl” and that was it. Before, I had felt like a lot of the girls feel, I was afraid to screw up in a really loud way! Obviously we know that’s a problem for a lot of women too, not just young girls. Watching how the kids changed over the week, I changed too. I got an amp and took a big break from cosmetology school (whoops!) to literally sit in my basement and write songs for my first show. I played solo (which turned into Fancytramp) with just my guitar, amps and pedals. I would never have done that if it wasn’t for rock camp. TLS: You're heavily involved with Nashville's DIY community, which is so important in times like these. What specifically do you work on? Why is it crucial to you to be involved? OS: As a band, we’re all so rooted in the DIY mentality. It’s so liberating to cut out ambivalent promoters, bar-focused venues, pay-to-play scams, and so many other aspects of the industry that make it hard for emerging bands. It gives us all the freedom to book touring bands we love/our friends and to be able to give them all the door money so that they can sustain themsleves. It’s so special to have places for those under 18 to hang out and see music that inspires them or changes their lives, because that’s what happened to us. I feel accountable to give back. Specifically, I help with a local space called Drkmttr. It was my friend Kathryn who started it. She’s a badass promoter around town. After doing it pretty much on her own, she decided to officially collectivize it. So there’s a big group of us who are passionate about DIY and all have different strengths and work together as a team to keep that alive in Nashville. Especially now, it’s SO important to have alternative spaces for all forms of art that's not for profit. In my opinion, our country needs that. TLS: Your new record is coming out Feb. 17 on Fraternity as Vanity. How’d you get involved with that label and why did you choose to release music on it? OS: It all goes back to the DIY scene, I’d say. The guys at FAV are members of our community and are in bands we love to play with. They understand how important DIY is and we like their aesthetic, not in a shallow way but because they’re artists too. They take pride in what they put out and pay attention to little details. It was fun planning it with them. The art for Little Deaths was done in house, so that’s cool too. TLS: What was the songwriting process like for this album? It’s been a tumultuous time both in the U.S. and in Nashville, did any of that impact the album? OS: We started the process in November 2014. We rented a church dating back to the 1800s outside of Athens, GA. We were surrounded by two cemeteries and it was a very energetic spot in the metaphysical sense. I think that colored the album a lot. When we’re home, we write in my charmingly dank basement. Like a lot of bands, we’re individually busy so we have a slower process which is actually good because it allows for a lot of reflection. I write the majority of the melodic structure and I focus heavily on lyrics. Lyrically it’s a very personal record. I first started out writing poetry and I think that comes out in our lyrics. Little Deaths was fun to make because we worked really hard on it being a true collaboration. We all love the idea of writing pop songs that are slightly un-pop. People have said our music has an anxiousness to it and I definitely think that reflects the times. TLS: I've seen a ton of your shows, which are always great! Do you record with performing in mind? For example, thinking about how a song is going to come across on the stage? OS: Yes, absolutely! We always want to make things as interesting as they can be. I think that’s a huge part of the writing process. We’re very much a live band. And even on our record, we wanted to reflect that. The two things, recording and playing live, are very symbiotic to us. We also like to play around with structure or write shreddy intros for the live show to keep things fun…and we all really like to noodle, so there’s that! haha. TLS: Let's talk about touring -- which you do quite often! How do you all stay happy and healthy on the road? What’s your favorite part about touring? OS: We all have our different rituals. For example, I hate to shower on the road. I like to build up road grime. Weston says I don’t smell, so it’s ok! But seriously, it is hard for four very different people to get on the same schedule. I think what we try to practice the most is patience and realizing it’s not all about you- it’s a team effort. Not everyone is going to feel 100% all the time, so it’s important to remember that. We all like to eat pretty healthy so we go to health food stores galore, but whenever we’re in New York we have to get pizza. My favorite part about touring, besides playing shows (which is like 10% of it) would be the weird stops along the way. Sometimes it’s having an afternoon to swim in a spring or randomly realizing you’re a mere exit from where Buddy Holly, Ritchie Valens and The Big Bopper died and dropping by. Next trip though, we’re going to Paisley Park! TLS: You're hitting SXSW this March! Congrats! Anything you’re looking forward to down in Austin? OS: I think I can say with confidence, the food. I don’t think we’ll be down there for very long, so we’ll at least have some time to eat some tacos. TLS: Anything else you'd like to share about the record? OS: We did the bulk of the recording with Kyle Gilbride, but Joe McMahan did "Seeker" and Jake Davis did "Lost Cause". Jade Payne (from the amazing band, Aye Nako) mastered all of it. It takes a village to make a record, and we couldn't have done it without our friends! Also, fun fact- the cover was inspired by the movie Belladonna of Sadness. Listen to Idle Bloom on bandcamp.